A revolutionary treatment which treats tinnitus while the patient sleeps, which is exclusive to The Tinnitus Clinic, has won a top prize at a prestigious medical award ceremony. The Levo® Therapy System for tinnitus was awarded the gold prize in the Digital Health Products and Mobile Medical Apps category at the 19th Annual Medical Design Excellence Awards (MDEA) in the USA. Available exclusively at The Tinnitus Clinic, which operates 10 centres across the UK, Levo uses iPod technology to deliver a personalised tinnitus sound straight to the brain while the patient sleeps. The brain learns to ignore the hissing or buzzing and over time, the patient notices the tinnitus sounds less during the day. The sound-based therapy, which sees an iPod being approved for use as a medical device for the first time, has already been providing relief for tinnitus sufferers in the US since 2014. Developed by a team at Otoharmonics® Corporation, based in Portland, Oregon, USA, Levo is an FDA cleared and CE approved sound-based therapy which works with the brain’s natural plasticity to help the brain get used to, or habituate, to the tinnitus sound within the hearing centre of the brain. Mark Williams Chief Audiologist at The Tinnitus Clinic, London, said: “As the only clinic in the UK to offer this treatment to tinnitus sufferers, we are pleased to see Levo recognised for its innovative use of technology. 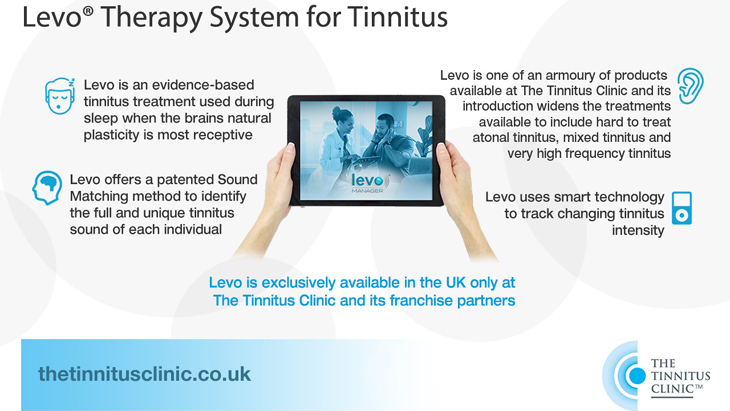 For further information on Levo, call The Tinnitus Clinic on 0203 326 1777, visit www.thetinnitusclinic.co.uk or e-mail info@thetinnitusclinic.co.uk. Discover the award-winning treatment for tinnitus practiced exclusively by The Tinnitus Clinic.. The Tinnitus Clinic launch Glasgow city centre clinic.